Brazil is the second largest agricultural exporter and it has significantly increased its crop area over the last decade and has reached to 8 million hectare. Thus, Brazil has opened huge opportunities for the growth of seed market. Over the next decade it is expected to continue the expansion of crop area backed by the use of advanced technologies and the supply of quality seed varieties. Brazil has openness for the use of genetically modified (GM) crops, and thus the agricultural sector accounted for 48% of the total exports in 2017. The Brazilian agricultural produce is of high quality that it provides competition to U.S. agricultural industry. Over the forecast period Brazil is expected to have largest food surplus in the world. Brazil is going through declining economy since 2016, also the economic slowdown in the export countries such as China and Euro Zones, have significant adverse impact on the Brazil economy and further the seeds market. Though Brazil is facing declining GDP, agriculture sector is still spurring in the current scenario with 21% contribution in the GDP, which can eliminate the risk of declining deeds industry. Dow’s, the major player of seed industry has its significant revenue share from corn seeds business. Goldstein Research analyst forecast that the Brazil seeds market is set to reach USD 10 billion by 2025, growing at a CAGR of 11.9% over the forecast period (2017-2025). Mergers and Acquisitions: Brazil witnessed the merger of two big players, Dow and DuPont. The merger is expected to benefit the Brazil seeds market by the development of transgenic seeds of several crops such as corn seeds. Based on oil seed type, soybean seeds accounted for largest market share of 58.6% in 2017 on the back of maximum share of soybean in the total agricultural production. Over the forecast period soybean production in Brazil is expected to surpass the U.S. soybean production. The report covers the present ground scenario and the future growth prospects of the Seeds market for 2017-2025 along with the market players’ analysis. We calculated the market size and revenue share on the basis of revenue generated from major players in the Brazil region. Brazil Seeds market is forecasted on the basis of seeds production and seeds supply and agricultural produce. Brazil Seeds Market Outlook 2017-2025, has been prepared based on an in-depth market analysis from industry experts. 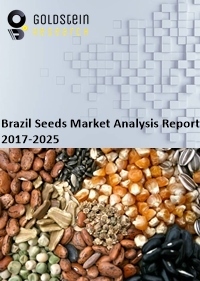 The report covers the competitive landscape and current position of major players in the Brazil Seeds market space. The report also includes porter’s five force model, SWOT analysis, company profiling, business strategies of market players and their business models. “Brazil Seeds Market Report” also recognizes value chain analysis to understand the cost differentiation, pricing models to provide competitive advantage to the existing and new entry players. Our Brazil Seeds Market Report comprises of the following companies as the key players: Dow, DuPont, Bejo, Syngenta, Rijk Zwaan, Monsanto, Advanta.